Melissa Hinebauch of Concord, left, and Deborah Jakubowski of Loudon, greet senators before they vote on a bill related to health care insurance at the State House in Concord. 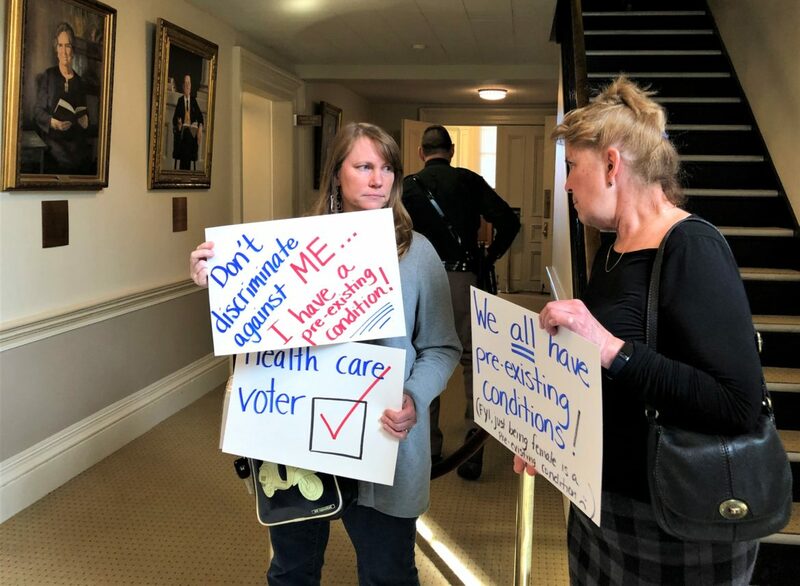 CONCORD – To protect residents from losing health care coverage as a backstop to the Affordable Care Act, the state Senate voted overwhelmingly Wednesday to approve Senate Bill 4. SB 4 would protect residents from losing health insurance for pre-existing conditions going forward. The vote was 22-1 with Sen. Martha Fuller Clark absent. Sen. Jeb Bradley, R-Wolfeboro, said the measure restores provisions that were removed from New Hampshire law after the federal Affordable Care Act was passed. Sen. Dan Feltes, D-Concord, said whether or not you like Obamacare, the Affordfable Care Act, there is uncertainty about its future. Senate Bill 4 would make sure that newborn and maternal care, substance misuse disorder, and mental health care would be covered in New Hampshire, Feltes said. But Sen. John Reagan, R-Deerfield, said when the government creates business requirements, they could move out of state or otherwise not provide the service. Perhaps, he said, that’s why New Hampshire does not have a lot of competitive choice for health insurance providers. Bradley said these provisions have long been law in New Hampshire. The Senate unanimously passed Senate Bill 308 relative to health-care workforce development and tabled it for budget consideration. It would increase the Medicaid rate by 5 percent the first year of the new budget and 7 percent the next year. Sen. Cindy Rosenwald, D-Nashua, said the state must increase the number of qualified clinicians in the state, especially in rural and under-serviced areas. There is added money for education and retention of clinicians, training programs and a state loan repayment program. “Let’s commit to investing in our health-care workforce now,” Rosenwald said. The Senate also agreed on a vote of 13-10 to pass a measure that would allow students and parents more information on standardized testing data in schools. It is Senate Bill 267. Sen. Jay Kahn, D-Keene, said statewide assessment data has been limited in the past and this would help students and their parents see active academic progress and allow parents to be more involved. “Currently, privacy does not allow for that,” Kahn said. It also passed and retained on the table for consideration on the budget, construction of a new 24-bed facility mental health facility in the state. Snowmobile registration fees may be going up a bit after the Senate passed Senate Bill 187 on a voice vote. The bill changes registration fees for Off-Highway Road Vehicle dealers and rental agencies, and for snowmobiles. Sen. Martha Hennessey, D-Hanover explained that money from registration fees has not been keeping up with the cost of trail maintenance. The bill sets up a two-step process to the fee increases, said Sen. Bob Giuda, R-Warren. The bill would also set up a commission to study what the state might do to help contribute in the future and also to see if there is a dampening effect on registrations if the fees. The Senate also passed a measure that will help low-income seniors afford prescription drug costs. Senate Bill 260 directs the New Hampshire Department of Health and Human Services to develop a prescription drug assistance program to pay out-of-pocket prescription drug costs for seniors who have reached the gap in standard Medicare Part D coverage.